Social media is teeming with pictures of small bright blue sea creatures washing up all over California beaches, with sightings reported in Humboldt County, Monterey and Ocean Beach. Despite being described as "strange," "bizarre," "mysterious," and even "aliens," it turns out these creatures have a name. Marine researchers are calling it Velella velella, a name the Santa Cruz Sentinel wrote sounds "like a nominee for the Best Foreign Language Film." "Some people call them jellyfish, but they are in fact only distantly related and only superficially similar," said Rich Mooi of the California Academy of Sciences. The small delicate-looking marine invertibrates are commonly called "by-the-wind sailor." They are 40 to 80 millimeters long as adults and are characterized by a clear, chitinous semicircular sail sticking above water. 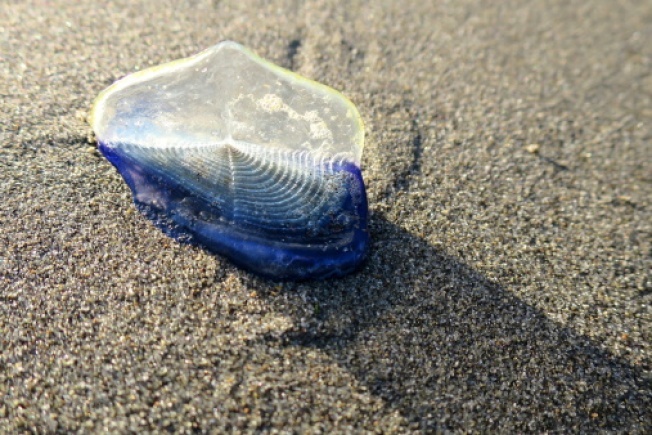 Velella can be found floating at the sea surface. They feed on zooplankton and fish and their predators are snails. They generally float offshore but can be blown onshore in large numbers. Nobody knows for sure why so many are washing up this late in summer. Although they are related to the Portugese man-o'-war -- notorious for its stinging ability -- Mooi said the creatures are completely harmless to humans, though he doesn't recommend eating them. Post by Ocean Beach Surf.